Introducing an outstanding award winner with a sunny color palette-perfect for adding bright beauty to the mid-season landscape. Prized for its brilliant hue and exceptional performance in the garden, it's easy to see why Jitterbug has won accolades from both home gardeners and horticulturists alike. Its well-formed blooms feature vibrant yellow standards above falls that sport generous red rays over a yellow base. Healthy plants boast a high bud count for plenty of eye-popping 4" flowers in beds, borders and bouquets. Easy to grow and deer resistant, it makes a fine naturalizer, spreading its beauty year after year. 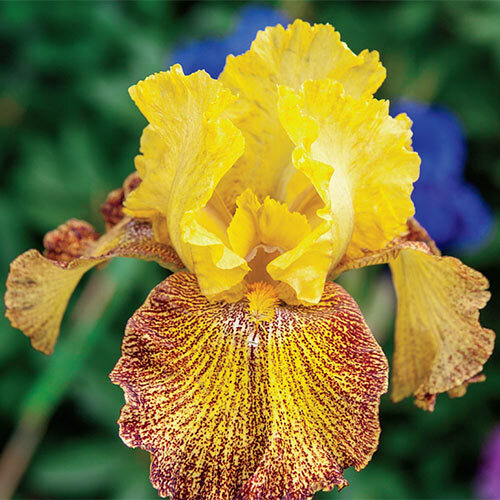 Mass plantings are a great way to showcase this magnificent iris.